great distances to share the Word with 100 communities along the banks of the Amazon. In 1948, Bishop Pirovano and Fr. Cerqua arrived in Macapá, where the missionaries would follow the city’s demographic explosion facing ever-new pastoral and social challenges. Maria Zuma Carneiro de Souza was still a child when the PIME Missionaries arrived in Amapá in 1948. She had just turned 12, and had no idea how important the presence of this group of missionaries would be for her region. The first to arrive were Bishop Aristide Pirovano and Fr. Arcangelo Cerqua, accompanied by Fr. Anselmo Pietrula, prelate bishop of Santarém; under whose jurisdiction was the parish of São José, which was the only church in Macapá at the time, the one that little Zuma attended. Today at 82, and with gray hair, they all call her Dona Zuma, she remembers those beginnings well. One of Bishop Aristide’s first ideas to bring the kids closer to the parish was the creation of a soccer team for boys, and a volleyball team for girls, including Dona Zuma. That experience left a mark on her life, she then won a scholarship for the Faculty of Physical Education in Rio de Janeiro. “Thanks to Bishop Aristide I went, I studied and I returned as a teacher of physical education,” she explains. Along with this came her commitment to the Church, which continues today. The life of Dona Zuma sums up what the relationship between the PIME Missionaries and the people of Amapáin has been these past 70 years: the missionaries identified the needs, they did their best to find solutions, and in return they have earned people’s trust. Moreover, when PIME arrived in Amapá, in the extreme North of Brazil, the situation was very different from that of today. The state capital, Macapá, had just 30,000 inhabitants in 1948. Today it has a population of 500,000; a demographic explosion that required a continuous effort to ensure that the city had the essential infrastructure for its inhabitants; much of the help came through the efforts of the PIME Missionaries. The Jesuits and the Franciscans had evangelized in the territory of Amapá before, but there had never been a stable mission. It was the German Missionaries of the Holy Family who took charge of Macapá’s mission, but only with three or four priests. “When we arrived in 1948,” Bishop Aristide Pirovano recalls, “there were two missionaries, truly heroic, but completely isolated. Most of the inhabitants declared themselves Catholics, but their religious life had been reduced to baptism and to some religious festivities once a year, or when the priest managed to visit them.” Bishop Aristide was appointed Apostolic Administrator, a role he held until 1955 when he was ordained bishop of the prelature of Macapá, destined to become a diocese eventually in 1980. PIME’s first mission was made up of a larger group of priests and lay brothers, they arrived a little at a time, but in less than a year a group of 13 missionaries was already scattered around Amapá. At the beginning, something new was invented to announce Jesus Christ and to meet people practically every day. Frs. Arcangelo Cerqua and Giorgio Basile, who came from southern Italy, used a system taken from popular missions. They had a large cross that they would plant in a place and would begin to preach. With the aim of attracting people, they organized a sort of stage play: one of the two would play the role of an ignorant person, asking questions, and the other would answer them, removing his doubts. In this way the biblical teachings and Christian values were transmitted in a playful way, like a dramatized catechesis. “Bishop Aristide had this great quality, he gave us the greatest freedom, he wanted everyone to invent something to express themselves as best he could in the realm of Faith as in the social field,” says Fr. Lino Simonelli, who was part of that first group of missionaries. With the growth of the population in Macapá new suburbs like Trem were born. The Church of Nossa Senhora da Conceição was built here, and was the first chapel built by PIME in Macapá; then came the suburb of Laguinho, where the church of São Benedito was built; and finally the Favela, to which the church of Our Lady of Fatima was given. The missionaries did not stop in the area of the capital, though: they also went to the neighboring towns, such as Santana, and the communities along the Pará river: Mazagão, Oiapoque, Laranjal do Jari, Porto Grande, São Joaquim do Pacuí and many others. Alongside the work of evangelization which was carried out through pastoral and catechetical activities, social works were born: such as the orphanage on the island of Santana; the hostel for girls who came to the city to study; the construction of several parish schools that taught activities such as carpentry or blacksmithing; the and the agricultural school in the Pacui region. In addition to these, numerous educational institutions were created: nursery schools and kindergartens, a seminary, sports clubs, cinemas and parish theaters, the welcoming shelter and many other facilities, big and small. 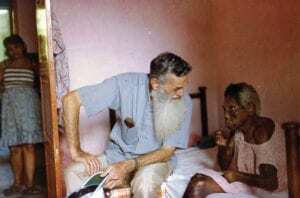 Bishop Aristide Pirovano, PIME, comforts a woman suffering from Leprosy. On many social frontiers in the north of Brazil, these missionaries arrived well before any action taken by the government. In this sense, it is worth stressing that their concern was to make people aware of the importance of education, and the means of communication, as useful tools for acquiring critical thinking and urging effective measures from their government. In Amapá, for example, the missionaries created the newspaper A Voz Catolica, the Gráfica São José and the Rádio Educadora. Since the number of missionaries was still insufficient, encouraging the participation of lay people in pastoral activities was fundamental. After the Second Vatican Council (1962-1965), and the discussions that emerged during the II General Conference of the Latin American Episcopate of Medellin in 1968, PIME encouraged the strengthening of the basic ecclesial Communities and contributed to the birth of the Pastoral Care of the Earth, today led by the Frs. Sisto Magro and Dennis Koltz. Over the course of two decades, pastoral workers also saw the involvement of Fr. Angelo Da Maren, who is now engaged in parish services and the coordination of the Diocesan Missionary Council. 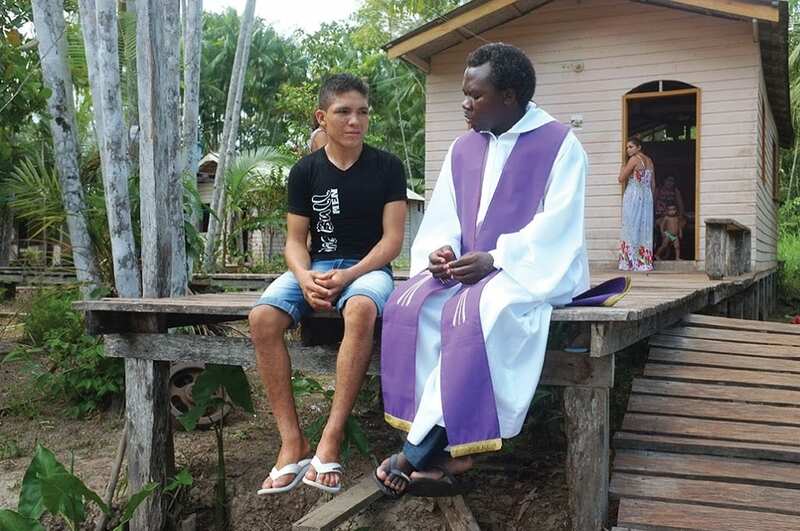 After consolidating all of their parishes, PIME completed its first mission in the region: all the churches and chapels were handed over to the diocese of Macapá, built thanks to the work of the missionaries. This is why the situation in Amapá today is a little different: there are only 10 missionaries left, all of them with a large workload. Fr. Luigi Carlini, as well as being a parish priest in a community in the suburbs, has been engaged in prison ministry for 16 years. Another example is Fr. Dante Bertolazzi, has been involved in pastoral ministry for over 50 years in the region. Among the missionaries, those of Italian origin are still the majority, but the face of the mission has begun to change, with priests from the United States and from Cameroon. Even now, old projects are now side by side with new ones. As is the case with the Casa de Hospitalidade, founded by Fr. Luigi Brusadelli to offer refuge and assistance to those who are poor and abandoned. There is also the Areopagus project, created four years ago by Fr. Francesco Sorrentino, heeding the invitation of Pope Francis to be present in universities, and to foster the growth of an ecumenical and multicultural network of young people to discuss current challenges, in an attempt to form protagonists for the future. These are two projects that clearly prove that the mission never ends, but is continually renewed. The mission in Amapá has known different phases, but the essence remains the same: there are always new people waiting for the Good News to be preached to them. It is from this appeal that the PIME Missionaries in the North of Brazil continue to navigate the rivers of the Amazon forest to meet the people of the interior; especially the communities along the river banks. In Amapá, they are mainly spread on the Islands of Pará, which, because of their proximity, are part of the diocese of Macapá. Two PIME Missionaries, on board a boat, bring the joy of the Gospel to these people. A sheet glued to the wall shows the name of the over 100 communities that Frs. Enock Bouba and Giancarlo Vecchiato must visit throughout the year. They live like this: always leaving for the next destination. The boat is their home; the river is their life. The challenge remains, as it did in the past, in bringing hope to this part of the population, which literally lives on the margins of society.